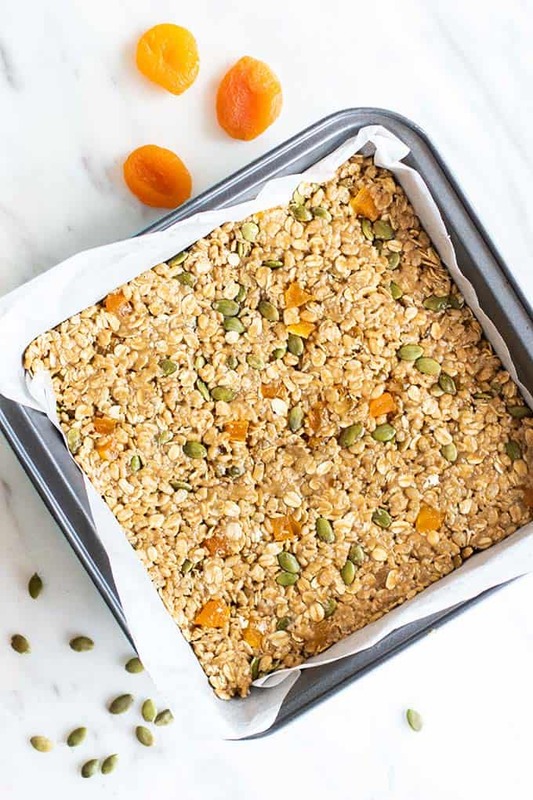 A healthy No Bake Granola Bar recipe made with SunButter. 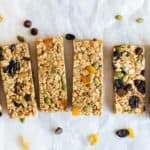 These gluten free and vegan granola bars are a great base for any additions you love! Keep the freezer stocked with these for snacks. 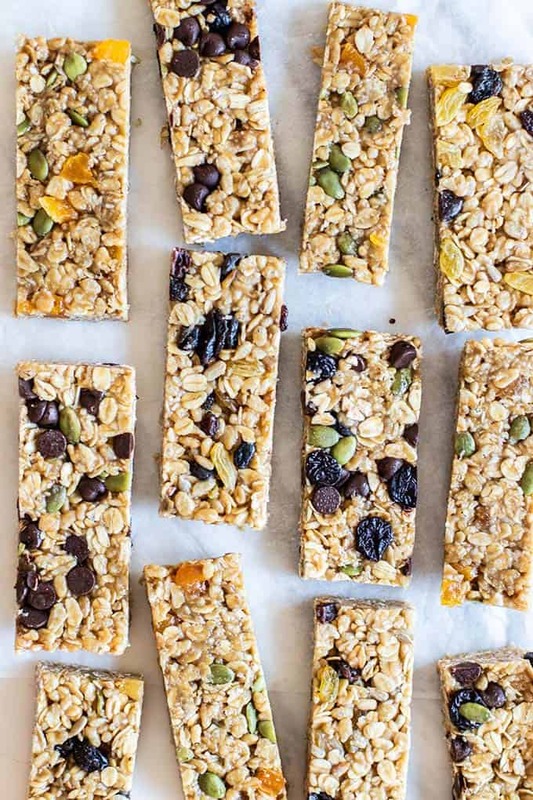 Granola bars are a kid-favorite in lunch boxes. And I have to say, I still enjoy them with my lunch! Especially if they are homemade, and have chocolate added to them (more on that soon!). 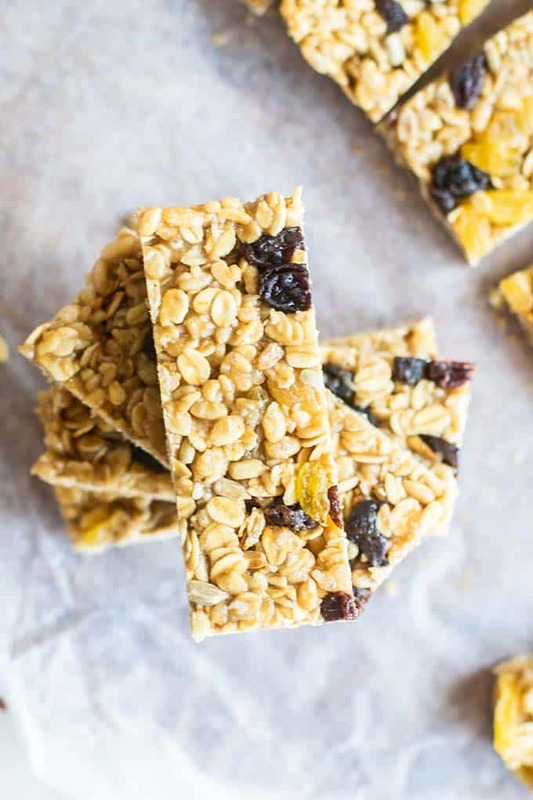 These no bake granola bars are super easy to make, and easy to customize with your favorite flavor combinations! 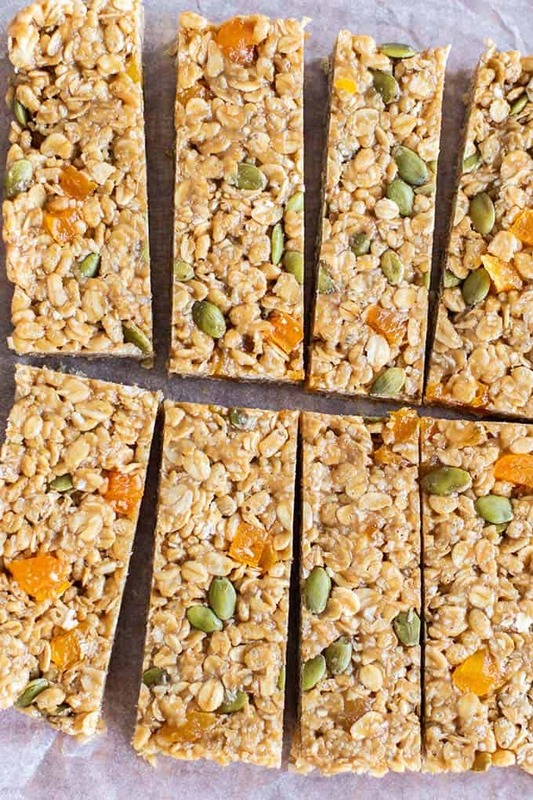 One you’ve made gluten free granola bars at home, there’s no going back. So delicious, SO easy, and great for dessert or snack attacks. These are made with my favorite nut/seed butter, SunButter. Because the spread is made from sunflower seeds, these are nut free. To keep these school and lunchbox friendly, all the flavor options I am providing are nut free. If you don’t have this restriction, feel free to mix these up with chopped walnuts, sliced almonds, or pecans! I like to use the Organic SunButter and the No Sugar Added SunButter in my baking. For these healthy granola bars, I used the Organic SunButter. Check out the other varieties over on their products page! I made 3 different varieties of granola bars to share with you! Choose your favorite, or get really wild and create your own! A pinch of salt — if using Organic SunButter. No need if using the No Sugar Added, which already has salt. 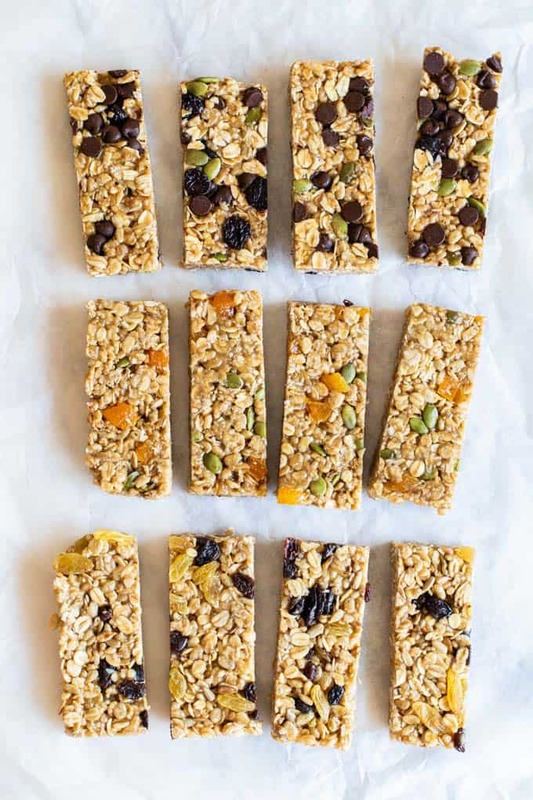 I tested these granola bars extensively to find the best combo of wet ingredients to make these granola bars NOT crumble, cut perfectly, and not be too sticky. Using all brown rice syrup or all date syrup results in bars that crumble, and not using coconut oil will result in sticky bars (that still taste delicious, but are a little trickier to eat!). Combine the granola bar “glue” with the dry ingredients, and mix well before getting to the fun part — additions! We all love different flavors — so I am not going to tell you what to put in your bars. I can offer suggestions though! My favorite is anything with chocolate. Seriously, just add chocolate and I’m good. 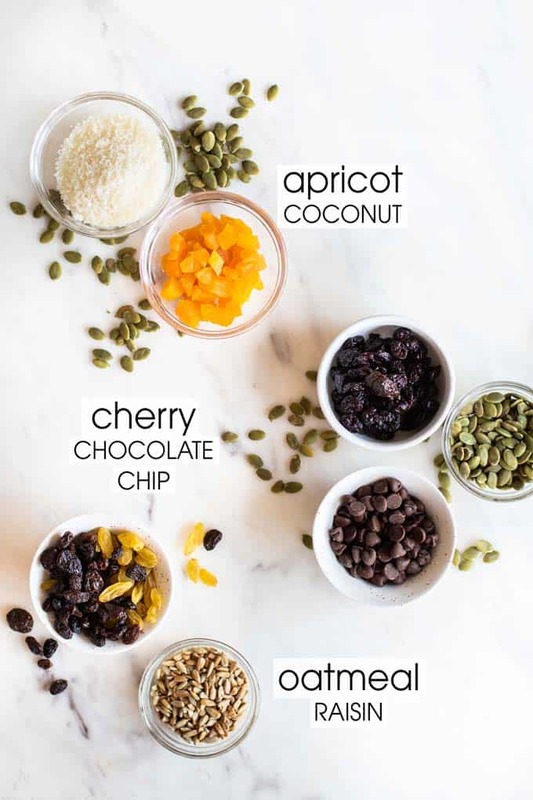 Try one of my flavor combos — Tart Cherry Chocolate Chip, Apricot Coconut, Oatmeal Raisin — or create your own! Pumpkin Seeds (or use sesame seeds or your fav nut!). Pro Tip: Add the chocolate chips in last, after you’ve already dumped the “dough” into the pan and allowed it to cool a few minutes. I also like to freeze the chocolate chips first so they don’t melt while I am trying to flatten the top and incorporate them into the bars. I adore coconut, so these are also on the top of my list. The bar “base” already has coconut, but this version has more! Pro Tip: If the apricots aren’t cut into small pieces, the bars will be more difficult to cut, especially if you freeze them first. 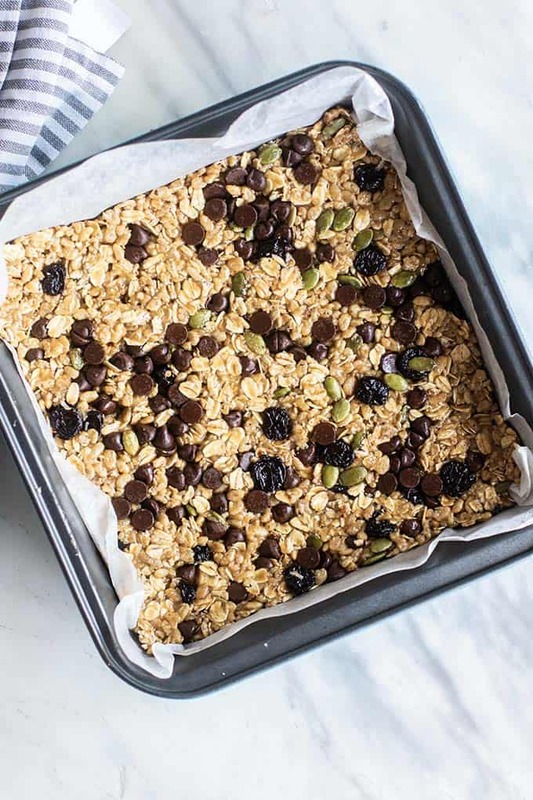 A classic cookie combo in no bake granola bars form! Pro Tip: Add dark chocolate chips here for a “chocolate covered raisin” granola bar! 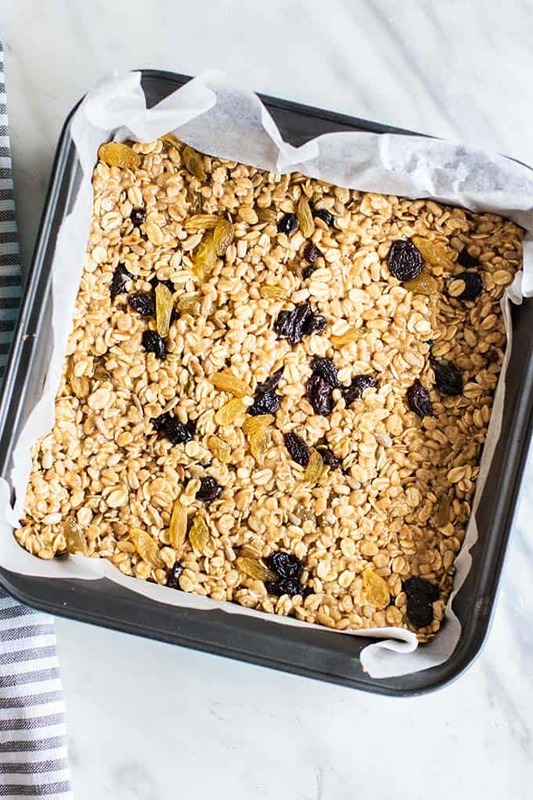 A recipe for a basic no bake granola bar, with mix in ideas for inspiration. 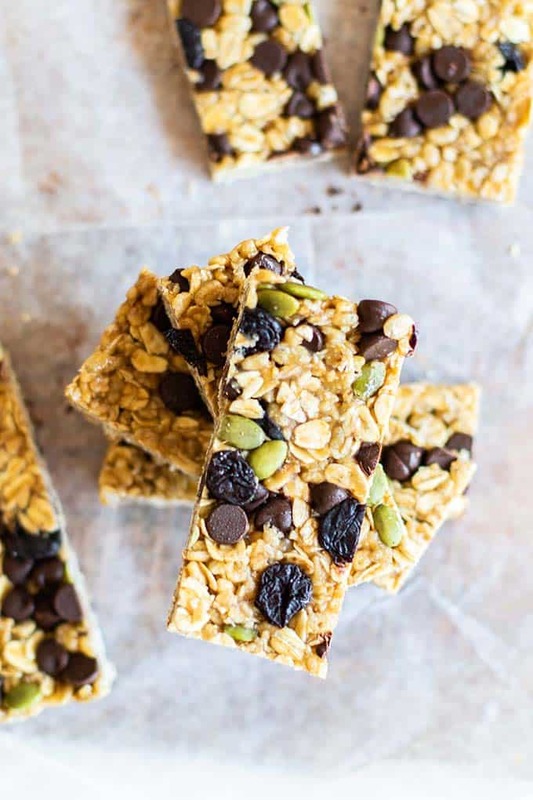 Make these your own vegan granola bars by using your favorite additions. Line an 8x8 baking pan with parchment and set aside. In a mixing bowl, add oatmeal, brown rice crisp cereal, coconut and salt. Salt is not needed if using the No Sugar Added SunButter because it already contains salt. In a small microwave safe bowl, add SunButter, brown rice syrup, date syrup, and coconut oil. Mix to combine, and then microwave for 30 seconds, or until the mixture begins to bubble. Stir well, and then microwave for another 15-20 seconds until it's bubbling again. This can also be done on a stovetop if you do not want to use a microwave. Pour the mixture over the dry ingredients, and stir well to fully coat. Add desired mix ins. If you have other creative ideas, use whatever you'd like. If using chocolate chips, do not mix until you have the mixture in the 8x8 pan and the mixture has cooled, otherwise the chocolate chips will melt. When I add chocolate chips, I add the mixture to the pan, slightly flatten it with my hands, and then allow it to cool a few more minutes before I sprinkle on frozen chocolate chips, and then press them in. Use a pastry roller or the flat side of a drinking glass to compress and smooth the tops of bars. Place in the freezer or refrigerator to set for at least 30 minutes before slicing. Store in the freezer for best results. These can be packed if the weather is cool. They will crumble if the weather is very warm. Try packing on an ice pack if adding to school lunches. *Nutrition Facts are for oatmeal raisin granola bars. 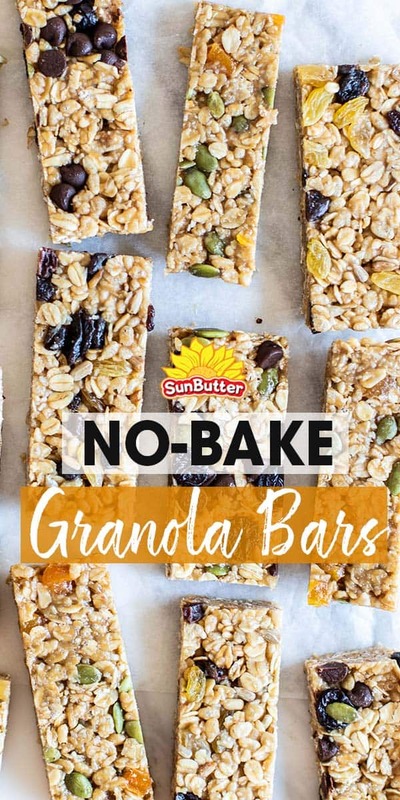 This No Bake Granola Bars post may contain affiliate links, meaning if you make a purchase, I will receive part of the sale as a commission. This helps me continue to bring you lots of fresh and inspired recipes! This is just a perfect treat for my toddler. 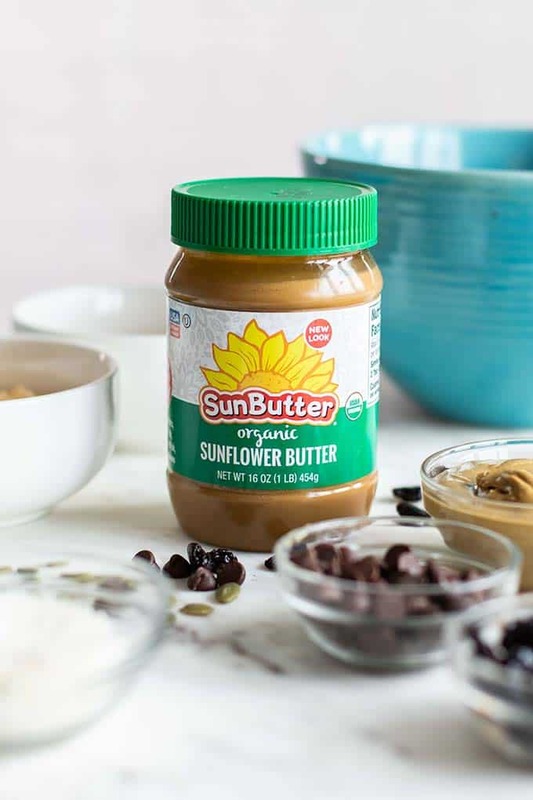 We LOVE Sunbutter! Always adore your easy recipes Michelle! I am trying to Cherry Chocolate version first!